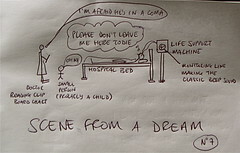 Last night’s dream was so vivid I wanted to record it straight away and share it with you in the Hugh Hughes Roughbook. If you look carefully, you can see the imprint from my drawing of the misunderstood hermit too. It’s like two pictures in one. There are lots more entries in the Hugh Hughes Roughbook on this website, and I might put up some more pictures of my dreams. Tags: Dreams, Hugh Hughes, hughs, Observations.